A not so surprising jacket! « T-Bird\’s crafty Blog! A not so surprising jacket! 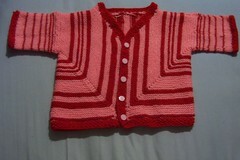 This is similar in looks at the front to the world famous Baby Surprise Jacket but totally different at the back! To get the shoulder measurement, use a garment that fits loosely and place a straight edge down from the start of the neck shaping, trying to keep it fairly parallel to the side of the garment. Measure across from the straight edge to the side seam. This cardi has a “drop sleeve” (ie I’m to idle to work out armhole shaping!) so this measurement may well be wider than just measuring across the top of the shoulder. The provisional cast on isn’t absolutely necessary but it makes smooth joins where you would otherwise need to pick up stitches. If I did it again I would make the armhole a bit bigger, my gauge was slightly off so it’s a bit too snug to allow for much growth in her arms! If you are using 2 colours make the changes at the back edge for neatness. Do not slip the first stitch until you get to the neck shaping, slipping them at the shoulder part makes for a sloppy seam which was a right royal pain to sew up neatly! Slipping them across the neck area makes it easier to pick up for the button band though! What I would do differently next time is in italics! “Pattern” row – knit to marker, replace it then knit next st twice, knit to next marker, replace it and knit next st twice, knit to end. I use a long thread as a marker and basically weave it in and out with each row. Totally unnecessary but it gives me the reassurance of seeing that nice straight diagonal line radiating out as I work! You could use a pretty ribbon and keep it as part of the garment! From now on, every time you get to the front edge of your work turn before the last stitch, placing a marker so you know where you are up to or slip the last stitch onto a holder. This makes the V neck front. Continue until work is 1/4 of your desired chest measurement ending at the back edge, take a break and congratulate yourself. You are half way there. You now have 2 options…. the easy way and the way I did it….. The way I did it – not being up for the brainwork of checking I got a mirror image for a second piece and wanting a smooth back without a seam down the middle of it. Make a chain ready to Provisional cast on the same number of stitches as you ahve just counted but mark carefully where the increase markers were and where neck shaping starts. Work down your back stitches then work in your provisional cast on sts up to the neck shaping. Place markers for the decreases as you go. Next row Knit down to first marker, replace it, k2tog or whatever dec you prefer to do, work to next marker,replace it and k2tog, work to end. Continue this way, bringing in 1 st at the front neck edge each time your row ends there until you have 4 sts left to bring in. Next row, make a short chain of 5 or 6 and use this to cast on 4 sts at the back neck edge at the end of the row. continue with all sts until this shoulder is the same size as the other one. Take another break and wonder why on earth you are doing this! using the stitches still on your needle (or unravel one of the provisional cast ons adn picking up those sts) continue in garter st decreasing 1 st at the under arm side (which will be half way through your row) every 5 rows to the desired lenght, work a few rows in Moss st and cast off. Variation – knit in the round on dpns and save yourself some sewing up – gives you a stocking stitch sleeve which my dd prefered. If you wish the garment to be a little longer, now is the time to do that. Just slip all the bottom sts onto your working circular needle leaving the rest on waste yarn or spare circulars. Work back and forth, slipping the first st to make picking up easier, for the desired length. I did a few rows but really didn’t need to, I just wanted to see how it looked. Take a leap of faith and sew up the shoulder seams. In case you are totaly baffled by the shapeless lump infront of you, fold the sleeves in half, this should make the garment sort of flip into shape, sew up the sleeves adn up to the neckline! Start button band – Okay this is where you NEED the circular needle rather than it just being an easier way to work. If you worked extra lenght at the bottom, start from there, picking up 1 st for every row (using those lovely slipped sts to make it easier and smoother) up the side of your extended bit then slip all the front sts, the 4 from the side at the back and pick up 1 st for ever row across the back neck, back down the other side, pick up for the extended bottom adn you are now ready to play. If you didn’t work the extra at the bottom then starting whereever you feel, slip all your sts onto your working needle, picking up 1 st for every row across the back neck. Mark the bottom corners, you will be increasing there twice every round to keep it from curling up. Work in moss st (or rib or whatever you like really) for 2 rounds. Work out where you want your button holes, count sts rather than measuring as it will be more even. Mark where they will fall. Work to each buttonhole marker adn make the hole by your prefered method. I went for yarn over, k2tog as that made a hole bigf enough for the buttons and is easy. Work 2 more rounds in moss and cast off loosely. Sew on buttons, press gently if you need to. 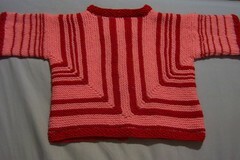 This entry was written by tbird and posted on 2 September , 2006 at 9:23 am and filed under children's knits. Bookmark the permalink. Follow any comments here with the RSS feed for this post. Post a comment or leave a trackback: Trackback URL.